Discover Tweed C our men's brogue country boot with five eyelets and triple ski hooks in premium hand burnished almond grain calf leather. Features include bold country style punching with all round leather storm welt for additional water resistant properties. Team these men's ankle boots with a grey blazer and dark blue slim fit jeans to create a smart casual look. Showing 2 of our total 12 reviews, with an average rating of 5 stars. 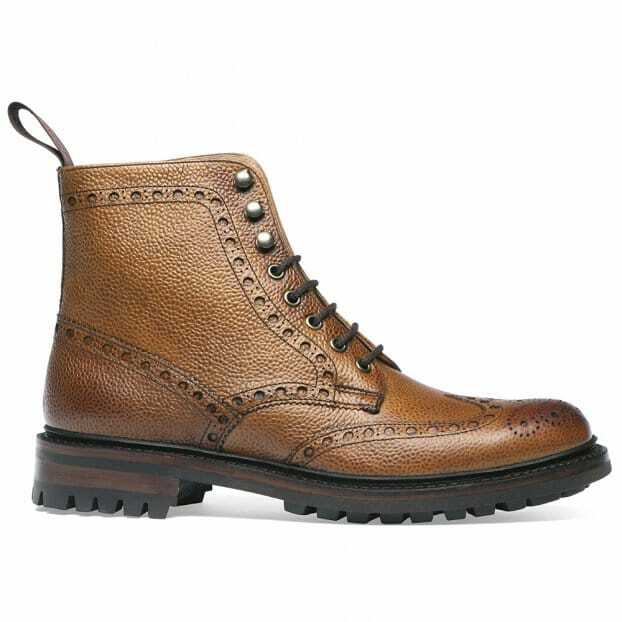 Read all 12 reviews for Cheaney Tweed C Wingcap Brogue Boot in Almond Grain Leather. I had been looking at these bought for a while now as I already own a pair in olive colour. I could not in all honesty justify paying the full price and when I was offered them with twenty five percent discount it was an offer I couldn’t refuse. The boots are very well made , easy to wear and look very smart. Very pleased with them. I am really enjoying the boots, really comfortable too. Solidly crafted with excellent styling. They go great with a tapered pair of denim jeans with the leg turn-upped twice. Loving them. I don’t want the winter to end!! !